Millions of Americans take dietary supplements, like multivitamins, every day. In fact, from 1988-1994, more than 40 percent of the American adult population took dietary supplements, and from 2003-2006 that number jumped to well over fifty percent, according to the CDC. However, despite their popularity, does the average American actually need to take dietary supplements regularly? The answer, in most cases, is no. While our bodies need vitamins in order to function, most people (especially in the United States) get all the vitamins they require from their diet. In some cases, taking excessive amounts of highly concentrated vitamin supplements—like vitamin C or E—over a long period of time may actually cause harmful side effects. With that said, there are some supplements, like vitamin D or probiotics, that can help certain people under specific circumstances. Here’s a quick breakdown on some of the supplements that you should either avoid or consider taking. For decades, consuming vitamin C was thought to help prevent colds, but unfortunately, that’s not correct. During the 1970s, one researcher presented a theory that vitamin C supplements might help the human body fight off colds, but recent studies have shown that the body doesn’t use that particular vitamin to fight or even prevent cold viruses from replicating. Additionally, vitamin C is water-soluble—so, when a person takes a supplement that’s packed with vitamin C, the body will only take and store a small portion, and then the large majority will be expelled as waste. So, taking a mega vitamin C supplement wont help to prevent colds, and your body will expel most of the excess vitamin C anyway. Taking heavy doses of vitamin C regularly, such as over 2,000 milligrams daily, over a long duration of time may increase the likelihood of kidney stones occurring, so it may be best to avoid vitamin C supplements all together. Vitamin D, when taken for specific needs, may actually be beneficial. According to Smithsonian magazine, a 2008 and a 2013 study on patients who regularly consumed vitamin D supplements highlighted that, when taken consistently, the vitamin helped to promote overall longevity. Additional studies have shown that vitamin D may help children fight off the flu virus, and it also might help older adults build bone density. While there is still debate on whether or not vitamin D can help increase a person’s life, consuming vitamin D regularly doesn’t seem to have any adverse side effects. Unfortunately, taking a multivitamin on a regular basis is unnecessary. The average adult already gets most of their daily vitamins from their diet—fresh fruits and veggies are loaded with valuable vitamins and minerals—so taking a multi-vitamin on top of everything is simply overkill. Many of the vitamins packed in a multivitamin are water-soluble, and much like vitamin C, your body will expel the large majority of the vitamins anyway. While there aren’t any major dangers from consuming multivitamins daily, it’s important to emphasis that these supplements shouldn’t be used in place of consuming fruits and veggies. The human digestive system is home to trillions of friendly bacteria cells. These bacteria help the body process foods, and when individuals suffer from very specific digestive ailments, or when a person is taking antibiotics, some of these friendly bacteria can be lost. Taking a probiotic supplement can help a person to restore the friendly bacteria population, which can help to improve an ailing digestive system. While the human body does need vitamin E, there’s no reason to take a specific vitamin E supplement. Some studies in the past have argued that vitamin E can help to prevent certain types of cancers, but more recent research has pointed out that this might be false—in fact, one study highlighted that taking vitamin E may increase the likelihood of prostate cancer amongst men. While ingesting small amounts of vitamin E is fine, high-does supplements should be avoided. Unlike vitamin C, zinc might actually help the body fight off the cold virus. Since zinc is used for basic cellular metabolism, some studies have shown that the mineral helps to hinder the rhinovirus’ (aka the common cold virus) replication process. While zinc won’t cure a cold, it might help to lessen symptoms and shorten the duration of a cold. Eating a healthy, varied diet is mostly all a person needs to acquire the basic vitamins and minerals the human body craves. 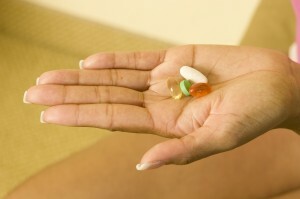 However, in specific incidences, certain vitamin supplements may be beneficial to a person’s health and wellbeing. If you’re considering taking a vitamin supplement, do a little research beforehand, and make sure to consult with your physician. This entry was posted in Informational, News and tagged supplements. Bookmark the permalink.